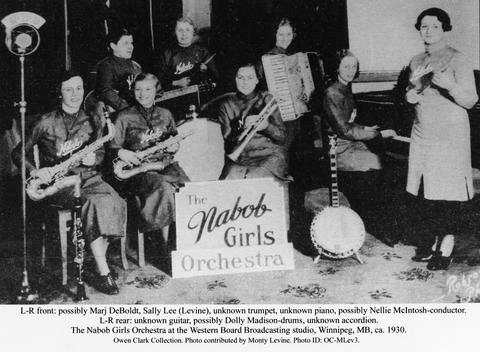 Photograph shows the Nabob Girls Orchestra at the Western Board Broadcasting studio, Winnipeg, Manitoba. Left to right front: Marj DeBoldt?, Sally Lee (Levine), unknown trumpet player, unknown piano player, Nellie McIntosh? (conductor). Left to right rear: unknown guitar player, Dolly Madison? (drums), unknown accordion player. Date of photograph is uncertain, circa 1930.